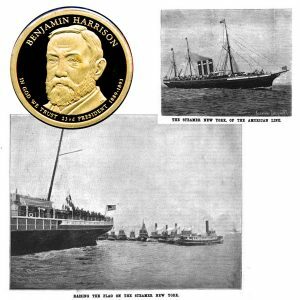 Today, the Benjamin Harrison Presidential Dollar Coin remembers when he naturalized the steamship New York on February 22, 1893. Raising the Flag on the Steamship New York. Under the existing shipping laws of the United States certain privileges are granted to vessels built in the United States which are denied to ships of foreign construction. The protection of the flag and employment in the coast trade are among the rights which home- built vessels enjoy. As a further encouragement to home shipbuilding industries, Congress has provided for the payment of bounties for carrying the mails, and under this law several fine ocean steamers are now being constructed. Among the most enterprising steamer companies of this country is the International Navigation Company, of Philadelphia, which operates the Red Star Line of steamships as well as the old Inman, now the American Line. It began service in a modest way between Philadelphia and Antwerp in 1871, afterward establishing a terminus at New York. In 1886 it bought out the Inman Line and constructed the great steamers the City of New York and the City of Paris. Although owned by an American company it was necessary to build them in England and to run them under the English flag, and they have been thus operated for the past two years. It had been from the first the aim and ambition of the company to have an American line, under an American flag, operated by Americans, and owned by American capital. It was not until two years ago, however, that the way was opened by the passage of the new law giving bounties as stated. The company then set about the building of a fleet of new steamers, and made effort to obtain, by special act of Congress, naturalization papers for the two great vessels already built by them. In May, 1892, Mr. Cockran introduced in the House and Mr. Frye in the Senate a bill intended to bring it about. It authorized and directed the Secretary of the Treasury to grant registers as vessels of the United States to such foreign-built ships engaged in freight and passenger business and sailing in an established line from a port in the United States as were of a tonnage of not less than 8,000 tons and capable of a speed of not less than twenty miles an hour, and of which not less than 90 percent of the shares of the foreign corporation was owned by citizens of the United States. A provision of this bill required the owners to build in American shipyards steamships of an aggregate tonnage of not less than that of the steamships admitted to registry. Both houses promptly passed the bill and President Harrison signed it. Immediately upon the passage of the act the company opened negotiations with the Cramps. These negotiations culminated within the last few weeks in the signing of contracts for two ocean steamships, to be slightly larger than the New York and Paris, capable of a speed of twenty knots, constructed with transverse watertight bulkheads, making these ships as absolutely unsinkable as are the Paris and New York, and fitted up with every device for safety, luxury and comfort. Five more ships are also to be constructed, all of them larger than the present ships, thus adding 55,000 tons to American ocean steamships of the first order. The aggregate cost of the fleet will then reach $14,000,000. While the outburst of cheers was at its height the President turned, and receiving the halyards from Capt. Jamison, he hauled the flag to its place on the top of the pole at the taffrail. This act was the signal for which the multitude had lined the shores all day. They saw the flag as the wind caught it, and took up the cheering of those on shipboard, while all the adjacent steamboats let themselves loose with all the noises within the compass of their whistles. And while the whistling and cheering were at full blast, the band broke in with “The Star Spangled Banner,” and the Chicago’s guns and the guns at Governor’s Island boomed forth a roaring salute. One of our illustrations shows the appearance of part of the fleet of boats at the moment of opening their whistles, on the raising of the flag at the stern of the great steamer. As part of the change of registry, the present ships drop the words “City of,” and will hereafter be known as New York and Paris. The New York left New York on Saturday, February 25, on her initial trip to Southampton, and there again a big demonstration awaits her, as the whole town of Southampton is very much exercised over the prospect of having that port made the terminal of a modern transatlantic passenger steamship service. Heretofore these ships have plied between New York and Liverpool. But hereafter Southampton will claim them. The abandonment of Liverpool for Southampton is calculated to save time and promote convenience, for vessels can go in and out at that port at any tide, and the ride from Southampton to London is only one and three-fourths hours. Special trains will run from all boats. Boats will leave Southampton weekly — at noon every Saturday — for the season. The New York will make her first trip to Southampton under an American captain, John C. Jamison. Under the new law granting subsidies or bounties the new vessels must be built with a view to employment in naval service in the event of war. The New York and Paris have been so built. The Navy Department has just designed a powerful battery for the New York. The battery will consist of twelve 6-inch breech-loading rifles, placed, one on each bow and quarter, and four on each broadside. In addition, there will be a secondary battery consisting of twenty six-pounder rapid fire guns placed on the main and hurricane decks, and eight one-pounder rapid fire guns mounted in tops. Each of the two masts of the ship will be given double tops. Each top will contain two one-pounder guns. The New York is 527 feet long and 63 feet beam. The horse power of her engines is 18,400 and her tonnage is about 10,500. Her trial speed was 20.13 knots. She has two sets of cylinders and a stroke of 60 inches, and her working pressure is 180 pounds. Under the old names the New York and Paris made great records as ocean fliers. The New York holds the record for the fastest eastern trip, 5 days, 19 hours, and 57 minutes, while the Paris lowered the colors of competitors on a western trip in 5 days, 14 hours, and 24 minutes. Both ships were the first to adopt the twin screw for ocean travel. The ship has a regular crew of 59 men and boys in the sailing department, and 198 men in charge of the engineer, Mr. John Wall. The Benjamin Harrison Presidential Dollar Coin shows with images of the steamship New York, circa 1893.